— perhaps by toxic chemicals, disease or malnutrition. That could make them especially vulnerable to predation long before they return as adults. The fisheries numbers are a little misleading, because chinook harvests have been cut back so severely in recent years. They are just a fraction of historical harvest levels and don’t include the number of chinook caught by tribal fishermen in the rivers. The principal author of the study, Brandon Chasco, told me he is updating the fishing numbers for his next report, which focuses on chinook consumption along the entire West Coast. In 1970, harbor seals were eating about 1.1 million chinook of all sizes, or 13 times more individual fish than killer whales, according to the report. In 2015, that number had grown to 8.6 million for the seals, or 104 times the number of chinook taken by killer whales. 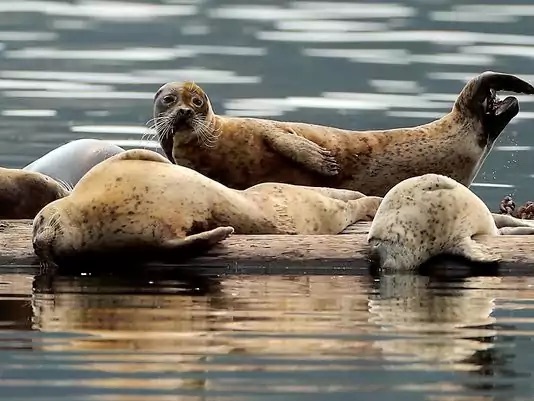 The study raises questions about whether seals and sea lions may be having a serious effect not only on the recovery of Puget Sound chinook but also on the population of the Southern Resident killer whales, which strongly rely on chinook for their survival. Many problems have been identified in the effort to rebuild chinook salmon runs, and predation by marine mammals is only one factor. But until recently seals and sea lions were not considered a major impediment. The new study adds an improved perspective on the entire food web surrounding chinook and calls out for increased attention to the role that marine mammals are playing in recovery of threatened and endangered species. It would be easy to jump to the conclusion that something should be done to reduce the population of seals and sea lions — particularly harbor seals, which dramatically increased in population after the Marine Mammal Protection Act went into effect in 1972. As with wolves that survived extinction to be reintroduced into their natural habitats, scientific and political debates could help decide how to balance the food web in Puget Sound in a way that all populations survive. No doubt more information is needed before anyone can plot a course of action. For example, there is some evidence that not all seals act the same. Some individuals or groups of seals may be specialists in eating chinook, while others may not be eating chinook at all. For at least 150 years, humans have affected the balance of nature, and now we cannot simply untangle ourselves without understanding the consequences. In a healthy ecosystem, most of our fish and wildlife populations would be much larger than they are today. Chinook salmon would not be headed for extinction, nor would other species of fish. And harbor seals would not be viewed as a population problem but simply one species among many, all helping to maintain a natural balance in the food web.